For other uses, see Arkley (disambiguation). 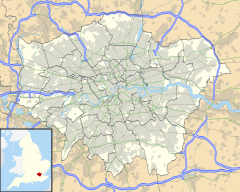 Arkley is an area of North London, England, within the London Borough of Barnet. It is located 10.6 miles (17.1 km) north northwest of Charing Cross. It consists of a long village strung out between Barnet and Stirling Corner, roughly centred on the "Gate" pub, and composed of the ancient hamlets of Barnet Gate, Rowley Green and Arkley. At 482 feet (147 m) above sea level, Arkley is one of the highest points in London. The origins of the name Arkley are unclear; it is first recorded as Arkleyslond in 1332. The first element of the name appears to come from the Old English word (e)arc (or ark, meaning a chest, bin or other wooden receptacle), while the second element is from leāh, a woodland clearing or glade. –lond in the earlier name means "cultivated ground". The name Arkley would thus mean "woodland clearing by the ark or by the place where arks are made". It is thought by some that Hendon Wood Lane was originally a minor Roman road. Certainly the name, 'Grendel's Gate' (now Barnet Gate, and formerly known as 'Grims Gate'), is associated with the monster from the Saxon epic, Beowulf. This implies that the place was of modest importance as early as 1005. It may have been a centre of a small but significant community, founded on a woodland economy. The area is later referred to in medieval documents as 'Southhaw', and may have predated the settlement at Chipping Barnet. Certainly, Barnet manorial court was held here in the 13th century. From at least the early 19th century until the 1890s, Arkley was commonly known as 'Barnet Common' or 'West Barnet'. The establishment of the civil parish  of 830 acres (3.4 km²) in 1894 confused matters further, as it was defined by the rural area around 'Barnet Town', and included places as far east as Duck Island and Underhill. It is from the civil parish, and the later ward of Barnet Urban District (from 1905) that we have population statistics for Arkley. Between 1901 and 1971, Arkley's population rose from 483 to 16,832. It was transferred from Hertfordshire to Greater London in 1965. St Peter's Church, which was designed by George Beckett, was built in 1840 as a private chapel at a cost of £5,000. It contains a wall tablet of its benefactor, Enoch Durant, who died in 1848. The chancel was added in 1898. After Durant's death the advowson was transferred to the rector of Barnet, and an ecclesiastical parish was formed in 1905. According to the old article displayed on one of its walls, the Gate was once visited by Anna Pavlova and her dancing troupe. Until the early 1960s a large tree grew up from the floor of the pub and out through the roof. In addition, Dollis Brook and Folly Brook, which are also Sites of Importance for Nature Conservation, rise in Arkley. Local clay has been exploited for brick-making and pottery over the centuries. During the 1950s, a 13th-century kiln at Dyke Cottage was excavated, revealing a large cooking pot, and 19th century Ordnance Survey maps mark a "Tile Works". In the 1970s, John Britten produced a small racing car named the "Arkley" in the area. Arkley Golf Club was founded in 1909. The course was designed by James Braid and Harry Vardon.. On 29 November 1975, a Piper PA-23 Aztec aircraft piloted by retired Formula One racing driver Graham Hill crashed on the golf course, killing all six people on board. Graham Hill - retired F1 driver and Embassy Hill car owner, lived between Borehamwood and Shenley. He was killed when his private plane crashed on Arkley Golf Course in 1975. Trevor Howard (1913–1988) - actor, lived for many years in Arkley and also died there. Theresa Villiers - MP for Chipping Barnet. ^ Mills, A.D. (2010). A Dictionary of London Place-Names. Oxford University Press. p. 8. ISBN 9780199566785. ^ "St Peter's Church, Arkley". London Parks and Gardens Trust. Retrieved 3 April 2013. This page was last edited on 30 August 2018, at 06:41 (UTC).